Become An Online Teacher/Tutor. Teach Online and Earn Money in India. Takshila Learning offers an opportunity to earn royalty income or extra income by utilizing your teaching skills and time. With an online teaching profession, you get to do what you enjoy doing - teaching and sharing your knowledge with students online. We are partnering with qualified and committed tutors to help millions of students in India and worldwide to score excellent marks. If you have passion, knowledge, and interest in online teaching, come and grab an exciting work opportunity with Takshila Learning. We offering two platforms for teaching you can select any of them or both. • Working from a convenient place of your choice and time. • Teach students live from all over the world. 2. 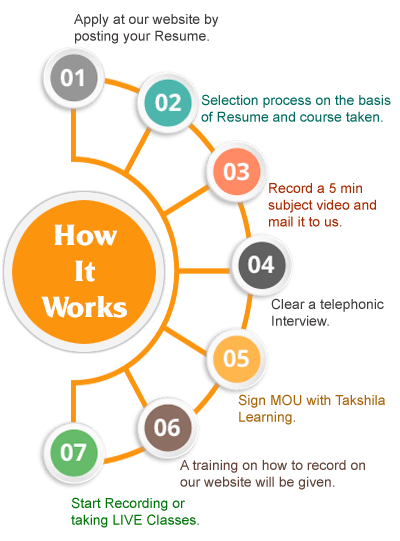 Record courses with us. • Record your subject with us. • No investment, no maintenance cost, no administration tension. • No limits on the number of students. What Is Required To Became A Teacher At Takshila Learning? • Laptop/Desktop (with web cam). • Minimum internet speed 2mbps. • Basic knowledge of computer. • Good communication skills & pleasing personality. • Exceptionally good knowledge of subjects. Join our list of teachers and work with massive possibilities for career advancement. Start earning at your convenience. I agree all Tutor Terms & Condition mentioned here.